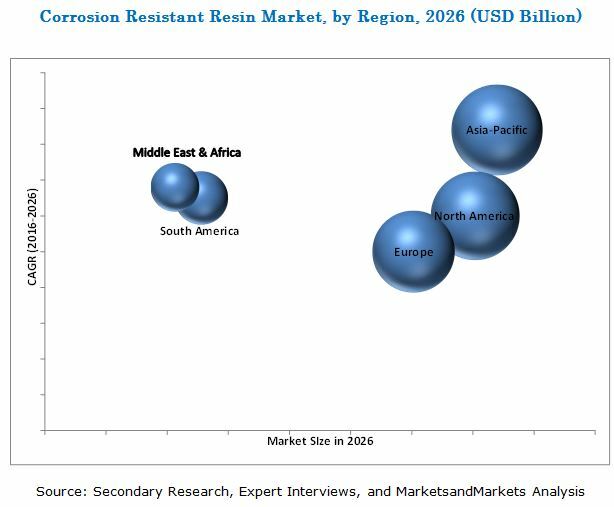 [156 Pages Report] The global corrosion resistant resin (CRR) market was valued at USD 6.30 Billion by 2015 and is projected to reach USD 12.56 Billion by 2026. The market is projected to grow at a CAGR of 5.7% between 2016 and 2026. In this study, 2015 has been considered as the base year. The time period between 2016 and 2026 has been considered as the long-term forecast period while the time period between 2016 and 2021 has been considered as the midterm forecast period. The main objective of the study is to define, describe, and forecast the CRR market on the basis of type, end-use industry, and application. The report includes detailed information about major factors influencing the growth of the market (drivers, restraints, opportunities, and industry specific challenges). 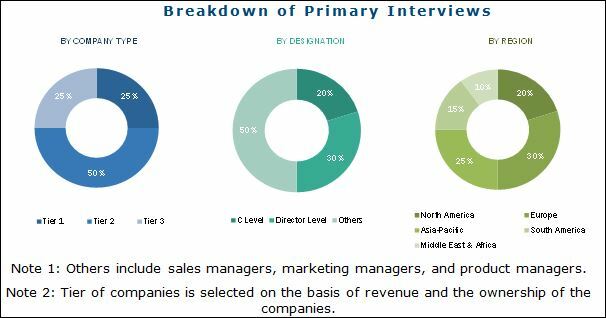 The report strategically analyzes market segments with respect to individual growth trends, growth prospects, and contribution to the total market. In the report, the market size has been estimated for segments, in terms of value, with respect to five major regions, namely North America, Europe, Asia-Pacific, South America, and the Middle East & Africa. In this report, market sizes have been derived through various research methodologies. In the secondary research process, different sources have been referred to identify and collect information for this study. These secondary sources include annual reports, press releases, and investor presentations of companies, white papers, certified publications, and articles from recognized authors. In the primary research process, sources from both supply and demand sides have been interviewed to obtain qualitative and quantitative information for this report. The bottom-up approach has been used to estimate market size, in terms of value and volume. The top-down approach has been implemented to validate the market size, in terms of value. With the data triangulation procedure and validation of data through primaries, the exact values of the overall parent market size and individual market sizes have been determined and confirmed in this study. The CRR market includes raw material suppliers, manufacturers, and end-users. Raw material suppliers include Eastman Chemical Company (U.S.), BASF SE (Germany), GE Plastics Hexion Inc. (U.S.), among others. Manufacturers in the CRR market are Ashland Inc. (U.S.), Reichhold LLC (U.S.), Hexion Inc. (U.S.), Huntsman Corporation (U.S.), among others. The end-user segment includes industries, such as oil & gas, heavy industries, automotive & transportation, infrastructure, and others. Each region is further segmented into key countries. The global corrosion resistant resin (CRR) market is projected to reach USD 12.56 Billion by 2026. It is estimated to grow at a CAGR of 5.7% during the long-term forecast period, 2016-2026. The CRR market is driven by increasing monetary losses due to corrosion and growth of the end-use industries. Another prime factor that is expected to bring momentum to this market is modernization of infrastructure. Based on type, the epoxy and polyester segments are expected to grow at high CAGRs between 2016 and 2026, in terms of volume. The epoxy segment is estimated to account for the largest market share in 2016, as epoxy is highly used in coatings and composites application, and possesses excellent corrosion resistance properties. Based on end-use industry, the oil & gas segment is projected to lead the CRR market during the forecast period. Corrosion resistant resins are widely used in the oil & gas industry as coatings and composites. Coatings are done on underground fuel storage tanks, pipelines to protect them from corrosion. Based on application, the coatings segment is estimated to lead the CRR market during the forecast period, as these coatings are most effective, durable, and cost-efficient. The composites application segment is expected to register high growth rate during the forecast period, owing to the growing demand for lightweight materials from automotive & transportation, oil & gas, heavy industries, and various other end-use industries to reduce the maintenance cost. The Asia-Pacific region accounted for the largest share of the global corrosion resistant resin market in 2015 and is expected to continue its dominance during the forecast period. The Middle East & Africa is projected to grow at the highest CAGR during the forecast period, owing to a large oil & gas industry in the region. Saturation in North America and Europe is posing a challenge for the CRR market to grow in these regions. Countries in these regions have a well-established infrastructure for public, commercial, and transport sectors, which is affecting the growth of the CRR market in these regions. Innovations are a must in the CRR market to serve applications better. Continuous portfolio optimization in the CRR market is important to stay competitive. In order to develop new and innovative products, technologies, and manufacturing processes, market players are collaborating with each other. These collaborations are expected to reduce competition in the CRR market during the forecast period. Major players adopted both, organic and inorganic growth strategies between 2012 and 2016 to strengthen their market position. Investments & expansions, and partnerships & agreements & collaborations were the major organic growth strategies adopted by the market players to enhance their regional presence and meet the growing demand for corrosion resistant resins in emerging economies. Ashland Inc. (U.S.), Hexion Inc. (U.S.), Reichhold LLC (U.S.) and Huntsman Corporation (U.S.), Scott Bader Company Limited (U.K.) are some of the prominent players in the CRR market. 12.10 Sino Polymer Co. Ltd.